After years of planning, designing and testing prototypes we finally have the final version of a new squonker device that has no match on the market, unique in design and performance. The feature that makes it so different is that we created a pump system that feeds the atomiser as it can it can be seen in the pictures of the product. 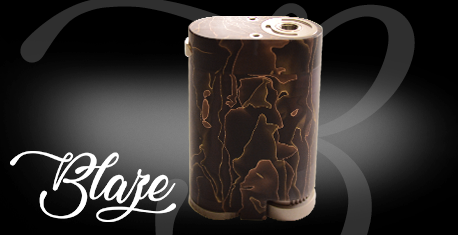 For this batch we added a matching drip tip for free! Composite material with fine brass and bronze mesh layers encapsulated in a translucent epoxy resin. The material has unique three-dimensional textures with contrasts between brass, bronze and deep coloured semi-transparent resin that allowed us to create an exquisite device that offers a smooth tactile feeling when it is used. 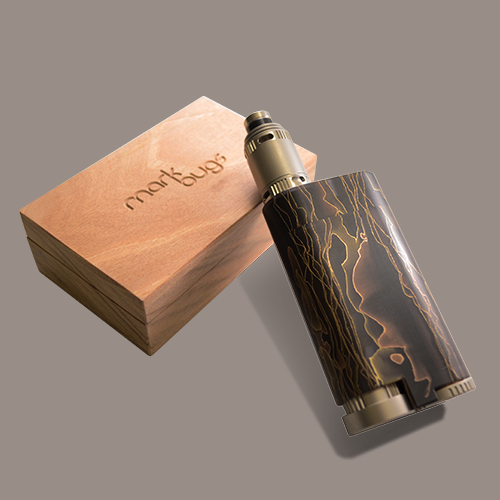 Made from stainless steel outside and beryllium copper inside, with a design that follows the curved shape of the mod. The connection is spring loaded in order to accomodate nicely to any 510 atomiser. 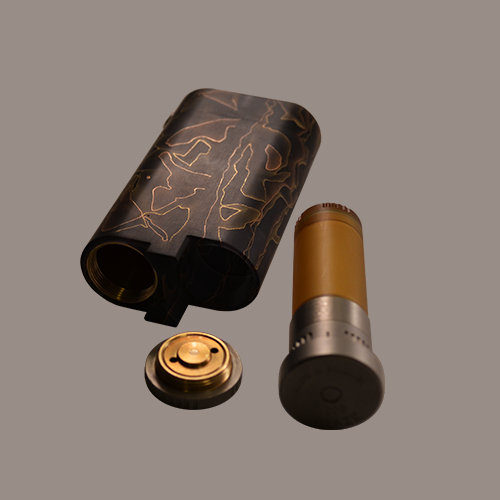 The battery compartment is entirely made from beryllium copper for a very good conductivity and has a classy touch of stainless steel outside to complete the design of the mod. It is very easy to insert and remove the battery by screwing or unscrewing the bottom, in order to adjust the correct position of the battery you have to rotate the beryllium copper part wich is very easy to be found in the back of the bottom part. For extra safety of the battery the bottom has two air vents. 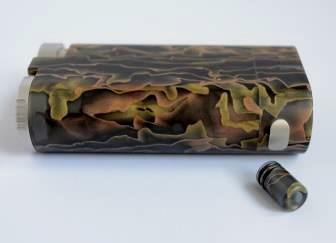 Here is where the magic beggins ... this is the innovative part that makes this mod so exclusive and mysterious. 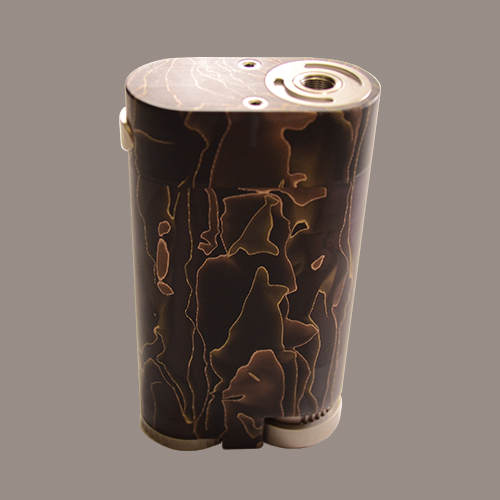 It is made from ultem, peeak and stainless steel, allowing you to see the quantity of the liquid that is inside. 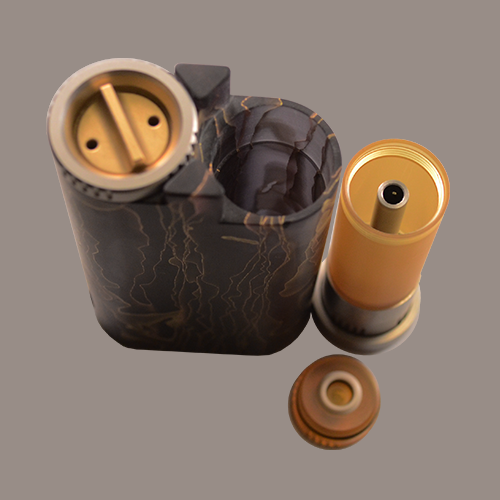 The adjusting system of the liquid that goes in the atty is solid and easy to use. 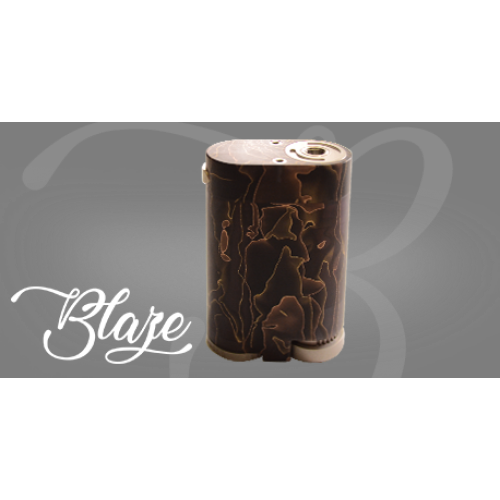 The magic feature of the BLAZE is that permits you to control the quantity of the juice you send into atomiser in order not to flood it or not to be enough, and you can do that effortless by screwing or unscrewing the middle part of the pump. There you will find five dots that will allow you to know the correct position for your attys. On the bottom part of the pump system you will find the serial number.